This is the third year that the institution is staging its Hats off to Reading programme. The students converged at the New Testament Church of God at Wilson Hill, where a number of students were awarded gift and prizes. Sounding like seasoned professionals, some of the male students led the march with their skilful play on the drums, which prompted several passers-by to shake their legs. 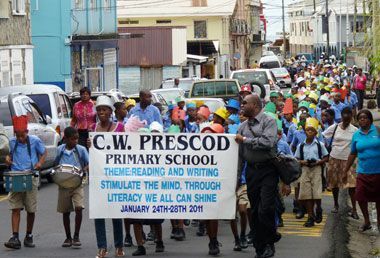 Held under the theme: âReading and writing stimulate the mind: Through literacy we all can shineâ, the programme which commenced on Monday, January 24, kicked off with a grand book fair, which was supported by several bookstores around Kingstown. Tuesday, January 25, was dubbed reading day, where a competition was held among the sports houses. The students also visited the the Paediatric Ward of the Milton Cato Memorial Hospital (MCMH) and read to the children there. On Wednesday, January 26, a visit was made to the National Public Library and an impromptu writing competition held. A parent workshop was also hosted that same day to address the reading problem among some students. A second visit was made to the National Public Library on Thursday, January 27, and an impromptu speech competition was staged. At Fridayâs closing ceremony, the students showcased their talents in song and poems. Principal Hyacinth Harry made brief remarks and Pastor Terrance Haynes delivered the feature address. Suzette Abbott-King, Literacy Co-ordinator, told SEARCHLIGHT that the school is making every effort to equip the students with the necessary skills in preparation for higher learning. âWe are trying our best and we expect these children to do very well,â she said. Abbott-King said that it is incumbent upon parents, teachers and the community to assist in the students development and success. âItâs not just the parents or teachers, we need everybody to help these children to achieve their goals,â she urged.